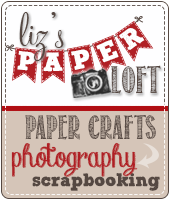 Liz's Paper Loft: MCT October Release Blog Hop ~ sweet holiday! 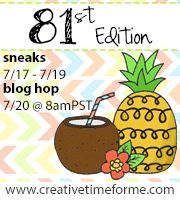 Hey hey hey it's blog hop day for My Creative Time! 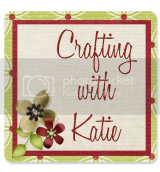 You should have arrived here from the sweet Miss Kim's blog, if you just popped in to see me then please head over to our creative Miss Emma's blog for the start! 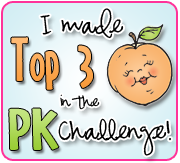 I'm not going to keep you long, but hasn't this week been fun with all the creative goodness! To create this card I first did a bit of "smoosh" watercoloring to create the background, then stamped the image and colored it with copic markers. The candy cane stripes have a tiny bit of wink of stella for interest. Beautiful job! I love how you colored the sloth to make him furry! if your going for the look of a kid with a messy eating habit you hit it dead on!!! I love it, he looks all sticky and cute!!! Love your water colored background. 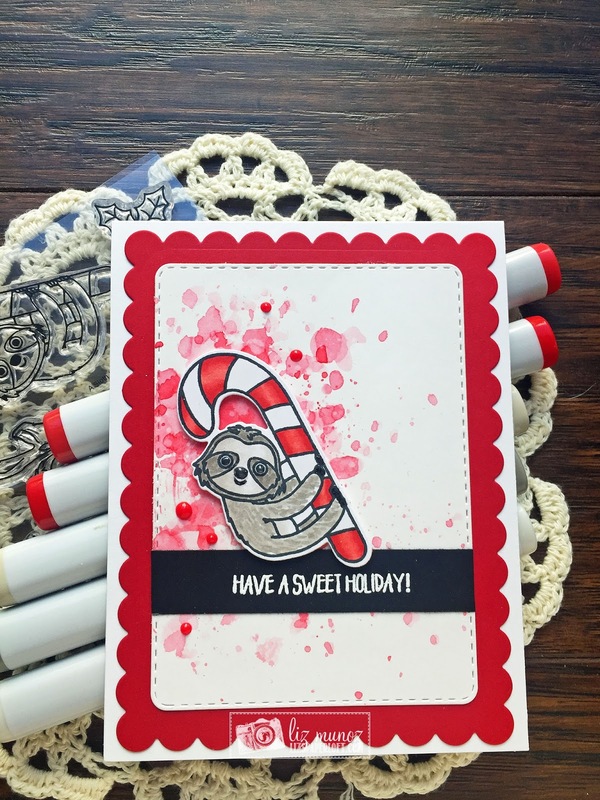 That sloth is darn cute on your card! Cute. I like the background and your coloring. OMG Miss Liz Your Card is so Adorable!! Love your smooshed background....made me think that that little Sloth got into the Candy Canes and left marks on the wall. 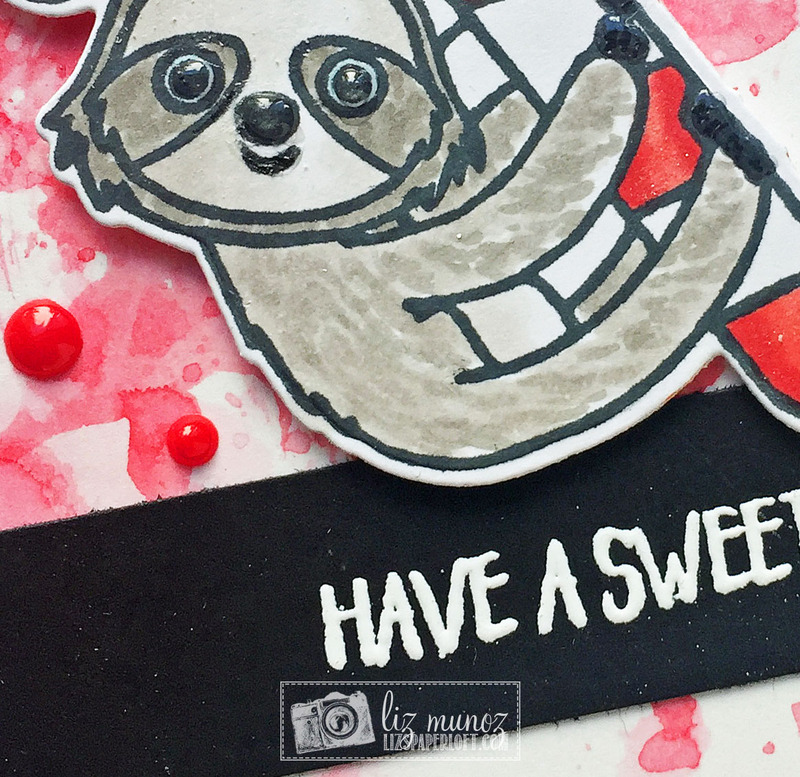 LOL Guess Beauty is in the eye of the beholder....and this beholder got a big chuckle with this thought...cause this little sloth was mischievous ... LOL Your card is Spectacular!! Cute!! 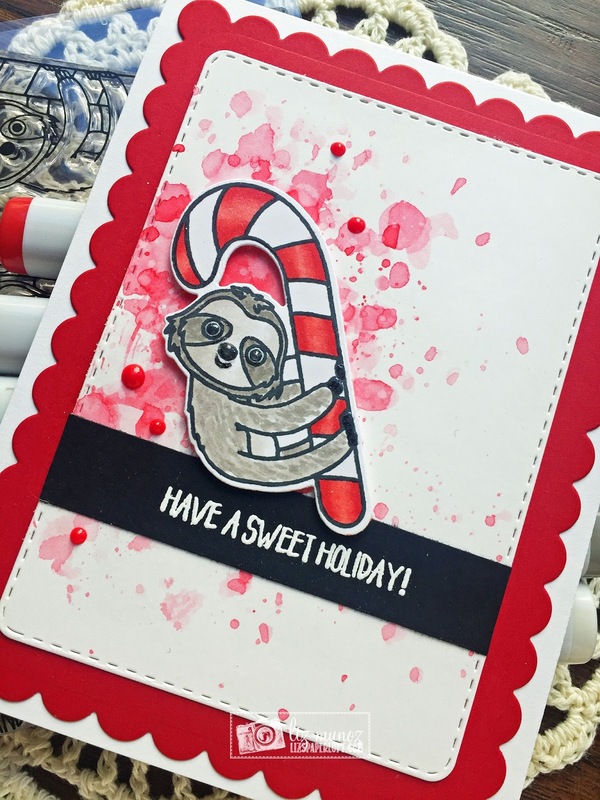 Love the sloth holding the candy cane!! 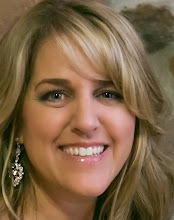 I love your background! It reminds me of peppermint ice-cream! Such a cute card! Your card is adorable. I love the simple colors you choose. Just wonderful. 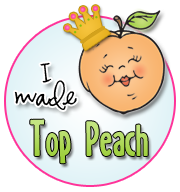 Thank you for sharing your projects this week!! SUPER CUTE!!! Thank you for your AWESOME sneaky peeks this entire week!!!!!! Loved your smooshed background! Such a delightful fun card!